Students of the Los Altos Academy of Engineering in Hacienda Heights east of Los Angeles will shortly hold an open house to show off HICE, their one-of-a-kind vehicle with an hydrogen internal combustion engine. The vehicle, which they say is the first of its kind built by high school students, uses a four-stroke engine from Honda that has been converted to burn hydrogen without the use of gasoline. The composite chassis resembles a massive red and white tongue with a notch to hold the driver. After a test drive in February, which was captured on video," the project team believes the car is ready for its public showing. "The bugs have been fixed, but there were a couple of safety issues we have to consider before we run the car up at our open house," said project manager and student John Weng. The Academy is a joint program between the Hacienda La Puente Unified School District and La Puente Valley Regional Occupational Program that exposes high school students to potential career paths through training vocational and business skills, hands-on experience, and exposure to engineering and technology. Projects have included solar powered cars and human-powered airplanes and frequently feature associations with companies, including Toyota and Boeing. 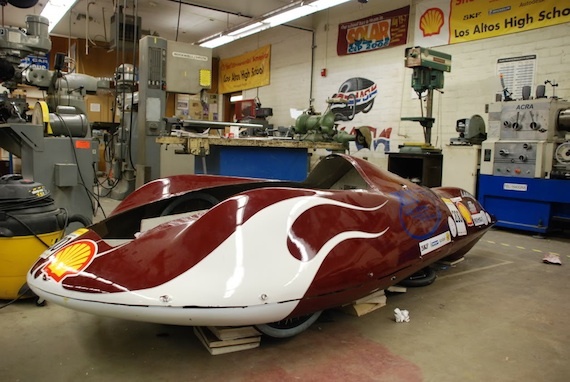 The May 8 event will also show off the school program's other vehicles, including Solar Shadow, which raced across Australia in the World Solar Challenge; Infusion, a hydrogen fuel cell vehicle, which won first place in the Shell Eco-marathon; Speed Racer, one of the first electric cars built by the program; and Project Zeus, the school's entry for the 2007 government-sponsored DARPA Grand Challenge.